There's never a dull moment in Cancun, where beach lovers and revelers from around the world soak up the sun, the surf, and the excitement in "The Mexican Caribbean." The striking blue waters and white sand beaches of Cancun have made it one of the most popular beach destinations in Mexico, and there is something for every type of traveler on this postcard-perfect beachfront destination. Due to its location in paradise, Cancun is home to numerous top-tier beaches and hotels, thus it can be difficult to choose the perfect place to stay during your Mexican getaway. Fortunately, Vacatia can help you sift through the vast selection of hotels in Cancun on the beach so that you can book one of the best vacation rentals available. Vacatia strives to provide travelers with quality vacation rentals, because Vacatia knows that a hotel experience can either make or break a trip. 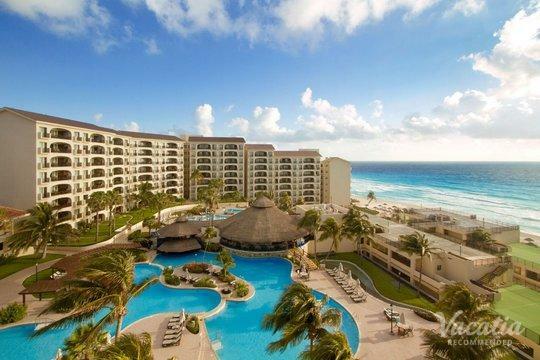 So if you want to stay at one of the best oceanfront Cancun resorts in this tropical oasis, be sure to work with Vacatia to book your accommodation. The aquamarine and sapphire blue waters off the coast of Cancun make for one of the most picturesque tropical backdrops in Mexico, which is why so many visitors travel to Cancun every year. There are numerous resorts in Cancun on the beach where you can take just a few short steps out of your hotel room and feel the warm sand between your toes. To soak up all that this Caribbean paradise has to offer, be sure to book your hotel through Vacatia, which provides customers with some of the highest-quality vacation rentals in the world's most popular destinations. Instead of staying in a small, crowded hotel room, you can stay in a spacious, comfortable vacation rental thanks to Vacatia's services. Vacatia focuses on delivering quality resort residences to its customers, and its unique vacation rentals provide the space and the comforts of a home - such as extra living areas and a kitchen - as well as the luxury amenities of a resort. There's no better way to soak up the beauty and excitement of paradise than with an oceanfront resort in Cancun, which is why you should work with Vacatia to find your perfect vacation rental in this popular Mexican resort town. Home to some of the best beaches in the Americas, Cancun is a popular destination for sun-seekers and ocean enthusiasts. Whether you just love soaking up the stunning views of the Caribbean waters or are itching to swim, snorkel, and jet ski off the coast, you are sure to get your beach fix during your stay in Cancun. Cancun is widely known as a popular spring break destination, but what some may not know is that it's also a great destination for couples looking for a romantic getaway and for families looking for a fun, memorable vacation. No matter what brings you to Cancun, you will be able to make the most of your trip when you rely on Vacatia to help book your accommodations in this Caribbean paradise.